I posted these for the first time a few years ago, and they remain one of my favorite projects! I thought it was good time to bring it out of the vault, and share again!!! We all love to give gifts to those we care about and appreciate, but being on a budget is part of my life, as I’m sure it is yours. I”m going to share with you one of my favorite gifts to give, and not only is it absolutely darling and super easy to make, it cost me less than $5! It’s a purse-sized photo holder that’s the perfect size to tuck into a purse or diaper bag, and everyone you give it to will love it. Think teachers, mothers, grandmothers, friends, and more! There are very few supplies that you need, and it comes together pretty quickly. They’re so fun to personalize, both with different papers and monograms. 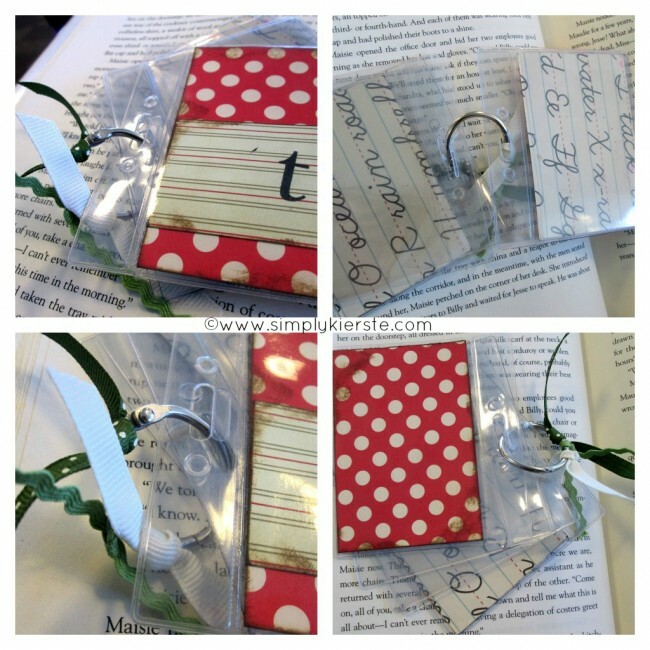 The book is made up of clear name badge holders, held together by a silver book ring, and embellished with ribbon and scrapbook paper. LOVE!!!! *You can find both of these items at Walmart, in the office supplies section. I’ve also had luck finding them at Target. Funny enough, I first checked at Staples and OfficeMax, and neither of them carried this smaller size. They did, however, carry the next size up–I think it was around 4×3–and if you wanted to do a slightly larger size, it would be cute too. 1. Cut 2 pieces of scrapbook paper to fit the front and back cover. 2. Embellish as desired. I used coordinating scrapbook paper for the piece along the bottom, and used a stamp to add the monogram. I distressed all the edges using Distress Ink (Vintage Photo). 3. 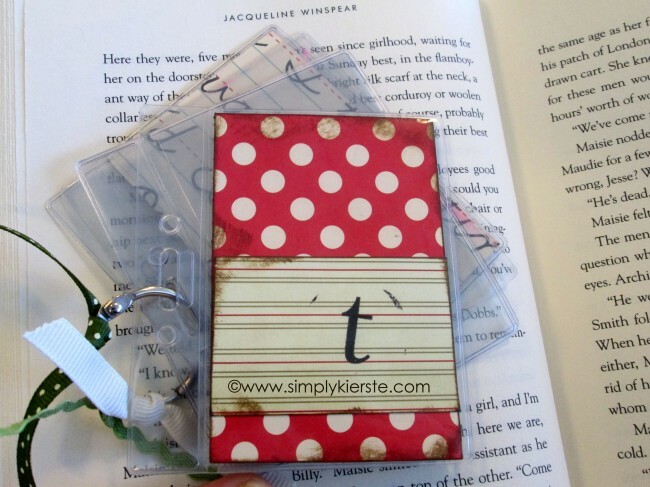 Insert front and back covers in name badge holders. 4. Stack together however many name badge holders you would like for the photo book, making sure that the front and back badges are facing the right way. Slide them on the ring, and close. 5. Tie 4-5 pieces coordinating ribbon on ring. Ta-da!!! Darling photo books that make the most perfect gifts!!! The name badge holders come in packs of 12 (at Walmart), and cost around $3.50. Add in one book ring, scrapbook paper scraps, and a few pieces of ribbon, and you’re around $5. It’s easy to make several of these at a time, because the book rings and name badges come in packs. 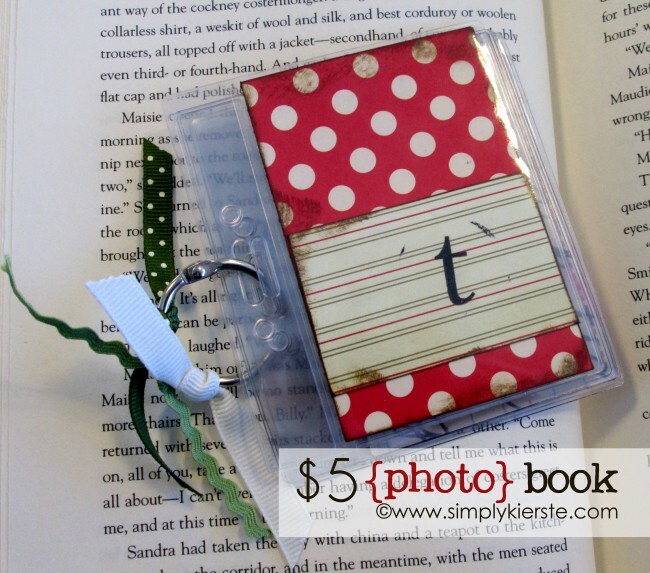 You can make at least 6 books out of one 12×12 piece of scrapbook paper, and ribbon scraps are perfect for this project! I love that everything can be easily purchased too! 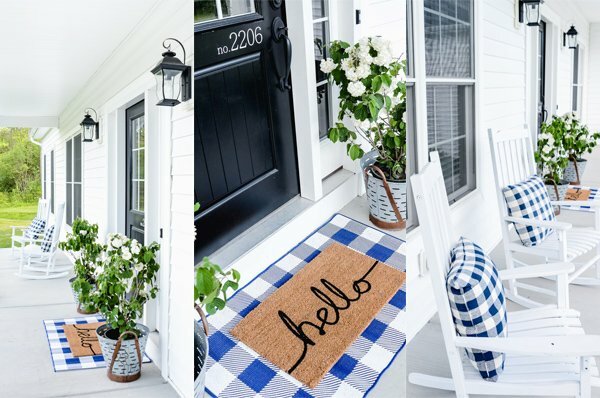 In the spring I am going to start hosting a craft night and these would be just perfect! What a cute idea. Anyone would love to get that as a gift! Wow – your blog looks awesome! LOVE the new look!!! :) Great project too! That is such a great idea. I love it. Wow! Another thing I just MIGHT try ;) Thanks! do you think photo paper would make it look good as well? Hi, I love you blog. I just found your page and love all the projects you featured. The Fishman–you mean instead of the scrapbook paper? I love this idea! I am definetely going to make them! Quick question…what is distress ink? I have seen it as a stamp pad…do you buy it in a bottle, tube, etc.? Thanks! Holly–It looks like an ink pad, and you can get it at any scrapbook store or craft store. The actual name is "Distress Ink", and comes in a variety of colors. These are awesome! What a great idea, and actually doable! I have way too many pics with my new hubby… I'm always looking for new ways to show them off! I loved this, and made some of my own for Mother's Day last year. Thank you for the great idea. That's really lovely. I like the color of that craft. I think discounted photo papers would be perfect for printing the photos to be placed there.